Duncan & Davies nursery in New Plymouth was the main supplier of native plants between 1918 and 1980. Victor Davies, a founding director, was a skilled plantsman and businessman, building the firm into the largest nursery in the southern hemisphere. 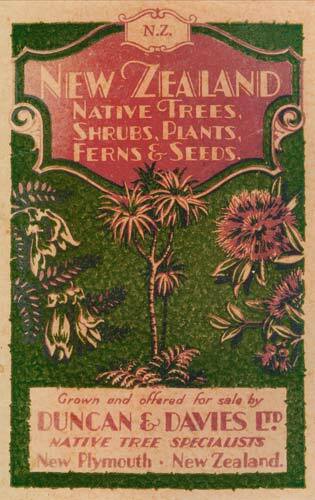 This is the front of an early catalogue, featuring kōwhai (Sophora microphylla), cabbage tree (Cordyline australis), pōhutukawa (Metrosideros excelsa) and a fern.